Welcome back to the somewhat arduous and absolutely rewarding journey into the centre of the outback and the heart of Australia. If you are just joining the drive now, it’s probably a good idea to go back and start at post 1. Unless you live in Coober Pedy…. So hopefully you’ve have a restful sleep beneath the earth (not the forever kind of rest, just the underground hotel kind). If you’re itching for one last sight-seeing extravaganza before you head back up the highway, then you can do a quick return trip to the Kanku-Breakaways Conservation Park. And by quick we mean about 70K, you know, in scale with the rest of the trips in the outback. The noteworthy item here, other than the 15,000 hectares of dusty beauty, lookout points, and dingos, is that Mad Max and many other popular films were shot on this beautiful part of the central desert. The area has been nicknamed Moon Plain for the way the clay floor cracks and the various fossils lying about. Surely a worthwhile stop. Recreate your own scene from Mad Max3 at the iconic Moon Plain in the Breakaways. Back in Coober Pedy and really ready to hit the road this time, head north once more on Stuart Highway. To feed the curious part of the mind, this leg is just over 150 kilometres and takes roughly an hour and a half. Also, you will lose phone service in the earlier part of the drive and you won’t get it again anywhere. Again, a good time to have friends around. Anyway the end of the leg lands you at Cadney Park or Cadney Homestead. Along this route are two major things to take note of (and one of them is actually a few hours off the route but, you know, the desert is big). 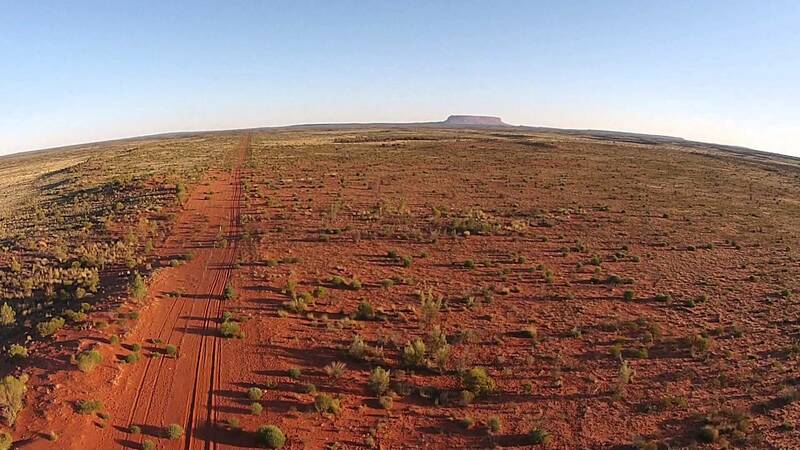 So the first thing is the very famous Dingo Fence, which is actually the longest fence in the whole world. It’s also one of the longest structures in the world. It was built in the 1880s to help protect livestock in the Southeastern part of the country, and it is though that it has actually worked quite well. 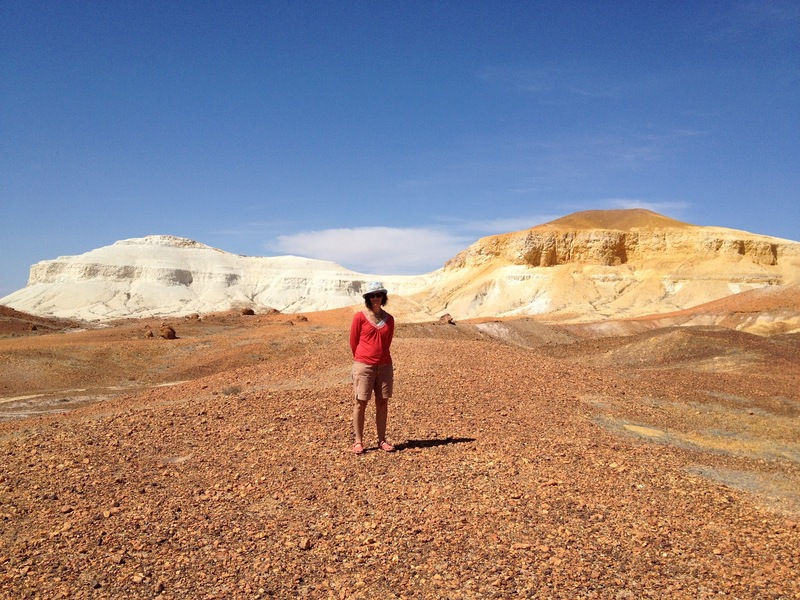 You’ll cross it about fifty kilometres out of Coober Pedy, so keep your eyes peeled. 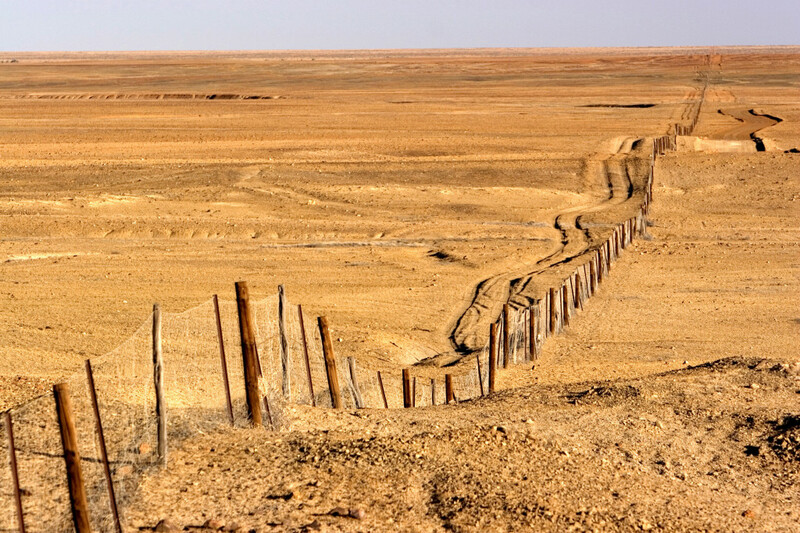 Dingo fence, the longest fence in the world. 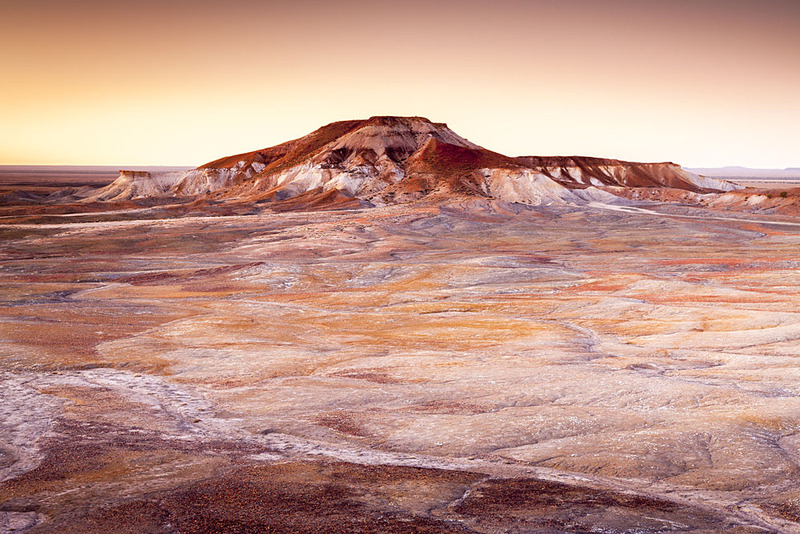 The second opportunity that this leg offers is the few hour detour to the absolutely stunning Painted Desert. If you’re not already in a 4WD then you can just ignore that part. If you’ve got the wheel-power, it might just be worth the trip. Since the turnoff is very close to the Cadney Roadhouse, you can even sleep in the charming little rooms and do the drive very early so you can stay on track for the rest of your trip. The stunning and aptly named, Painted Desert. The next bit is only about 45 minutes, and even before the end you will notice that your phone may have blinked back to life. This small little town of Marla offers your starving internet addiction a chance to refuel while you also get more petrol for your car. There isn’t much to note along the way here except that again, please do not do this at night time. There is lots and lots of roadkill along the way, and you’ll likely see it being scavenged by the incredibly large and beautiful eagles that inhabit the area. 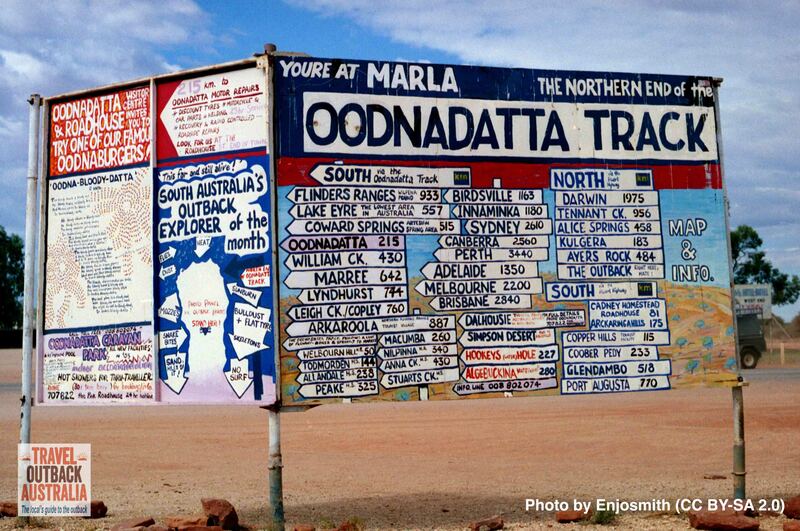 The other thing to note is that the Oodnadatta Track mentioned in part 1 ends here in Marla. So if you did take that route then welcome back! If you didn’t and now you regret it, well, you can decide to take it now and relive the glory of Coober Pedy all over again. Continuing on you may notice that there is more desert bush flora than back at the start of the journey. Some of these are the lovely Mulga trees, amongst desert oak and various other plants. You might also spot the occasional non-plant cow wandering onto the road from time to time, so best to be well rested and alert. You’ve got about three hours from here, receptionless, until you get to Erldunda Roadhouse, but you also have the option of stopping an hour earlier in Kulgera. They have food. They have fuel. They also have the turnoff the Dalhousie Springs which is an absolute oasis of natural artesian springs and it’s also not very close at all. So you may choose to forge ahead. The oasis of Dalhousie Springs on the not-so-short detour from Kulgera. 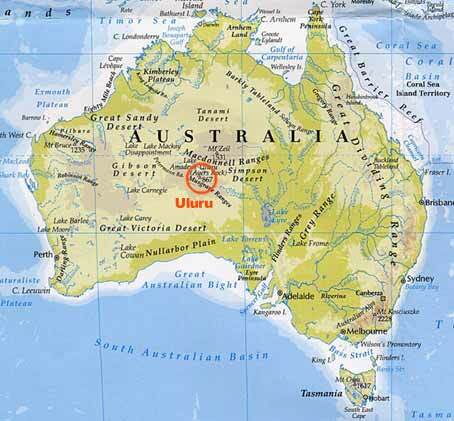 When you reach Erldunda you are officially at the turn off for the infamous Uluru. Ahead of you is 250K on the sealed road of the Lasseter Highway. If you don’t make the turn to this highway then you have decided to go straight to Alice Springs. If you need to make a stop for supplies then definitely go to the Mt. Ebenezer Roadhouse about 50 K in because it is owned by a local indigenous community called Imanpa. The charming and locally owned Mt. 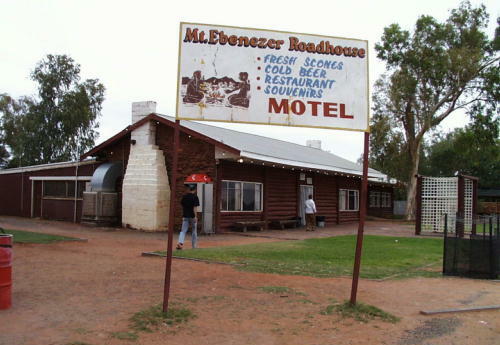 Ebenezer Roadhouse. You will come across another opportunity for a long-and-out-of-the-way-but-very-worth-it-detour at the Red Centre Way, or Luritja Road. 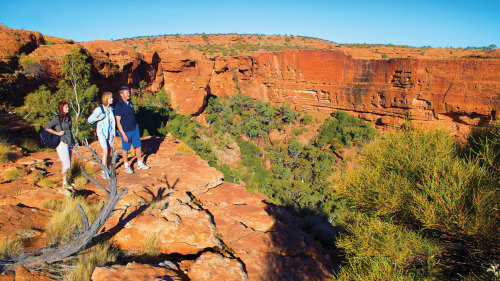 This road takes you to Watarrka National Park, also known as Kings Canyon, where you can take an incredible yet fairly doable hike around the whole canyon in a matter of hours. If you want to do this and also see Uluru then you will take this same road out and back. The majestic circuit of Watarrka National Park, Kind’s Canyon. Continuing along you will pass the Mt. Connor Lookout which offers views of the large plateau rock that you probably will think is Uluru if you have never seen it before. You will also pass various camping options like Curtin Springs or the free Mulga campsite only 80 K from the actual national park. Desert camping at Curtin Springs with Mt. Connor in the distance. The next leg is simply to drive to the Uluru-Kata Tjuta National Park. If you’re there early in the day then you can simply get a day pass and go drive or walk around the big rock. You can also do a second drive out to Kata Tjuta, known as The Olgas for a different but equally beautiful hike. 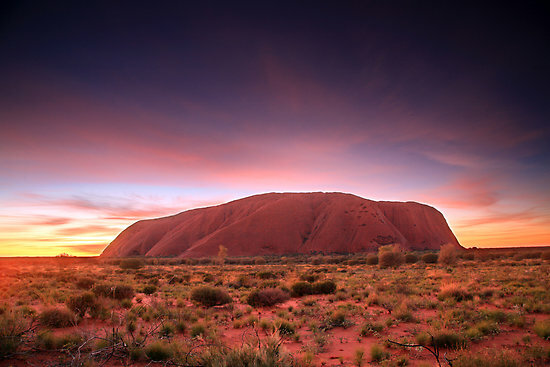 There are various sunset viewing locations to sit on top of your car and watch the dramatic colour changes of Uluru and the sun descends beneath the horizon. There are plenty of options to stay overnight that range from unpowered campsites to fancy hotel rooms. It’s good to do some research about the history of this sacred indigenous land and to remember that there is still the indigenous community of Mutitjulu that resides just next to Uluru. The stunning sacred site of Uluru during the early morning hours. There is so much to say about this wonderful part of the country, but its almost better to leave it up to you to discover on your own. From here the journey is yours, you can stay and explore, or head back out to Stuart Highway to check out the bustling city of Alice Springs. It’s only a 5 hour drive or so….or maybe it’s time to head home. Either way, stay safe, don’t drive at night, and make sure to slow down and take it all in. You are in the deep red centre of the country after all.